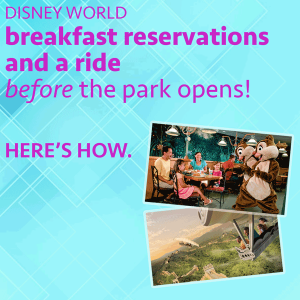 Disney World breakfast reservations and a ride - before the park opens! We often talk about pre-park opening breakfast reservations, but not about the attraction perks that sometimes come along with those. None of these are guaranteed, but are often added bonuses for people attending an early pre-park opening Disney World breakfast. To increase your chances of being able to eat and visit an attraction before park opening, you'll want to make your dining reservation as early as possible. The parks will usually open at 9:00, with the earliest breakfast reservation being at 8:05. People with early reservations should be sure to show up by 7:15-7:30 to get into the breakfast reservation line and enter the park as soon as they allow. Be sure you know how you will navigate to the park to make sure you're there on time. What if you don't have an 8:05 reservation? Let's say your reservation is at 8:20 or 8:40. You will want to behave as though you have an 8:05 reservation and hope the restaurant will seat you earlier. This is more likely to happen at some places (like Garden Grill) than others (like Cinderella's Royal Table), but it won't hurt to try. There are some park hours things that can affect your Disney World breakfast reservations. 1.) Opening park hours sometimes change after you've made your dining reservation which might mean that the park will open at 8:00. That would mean you'll be dining while the park is open and won't get to ride anything before the park opens. 2.) Extra Magic Hours scheduled in the morning mean that lots of people will already be riding by the time you finish eating. 3.) Early Morning Magic at Magic Kingdom is a ticketed event that allows people to enter Magic Kingdom on select mornings and visit Fantasyland attractions. They don't sell too many tickets to this so this shouldn't affect you too much. All of the restaurants below (except Be Our Guest) are fixed-price Table Service meals, so you should ask for your check shortly after being seated so you aren't wasting time after eating waiting to pay. Be Our Guest is the only exception because it's a Quick Service location where you pay for your food before you get it. To save yourself some time at Be Our Guest, you can order food online up to 30 days beforehand. Get more info on ordering breakfast at Be Our Guest. The current park opening procedure at Magic Kingdom allows anybody to enter the park all the way to The Hub in front of the castle. However, people with early reservations will be able to go beyond that for their breakfast reservations. Just look for somebody holding the breakfast reservation sign in The Hub area telling you where to go. Be Our Guest is a fantastic Magic Kingdom pre-park opening breakfast choice since it's the least expensive, quickest, and because people who are finished eating before the park opens are often allowed to ride Seven Dwarfs Mine Train - a huge perk since it's one of the hardest FastPass+ reservations to get, and the standby line builds FAST. Cinderella's Royal Table is another Magic Kingdom location where you can often ride Seven Dwarfs Mine Train if you're done before park opening, but it's not easy to do since the meal takes much longer. 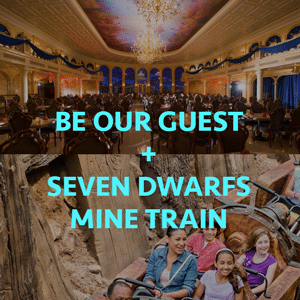 However, if you happen to have a reservation right when it opens and are able to eat and meet characters quickly, you can head toward Seven Dwarfs Mine Train. Garden Grill is a WDW Prep favorite character meal at Disney World, and people dining there before Epcot opens who are finished by about 8:40 can often hop on Soarin' before the park opens. Service is fast, food is delicious, you'll get to see the characters, and then you often get to walk downstairs to board Soarin'. Akershus princess breakfast is located right next to Frozen Ever After, and many people have been able to board before the park opens. 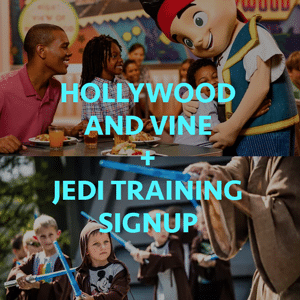 Signing up for Jedi Training at Hollywood Studios is very competitive and requires being at Hollywood Studios early, but people with pre-park opening breakfast reservations often get to do it before they eat and before the crowds arrive. 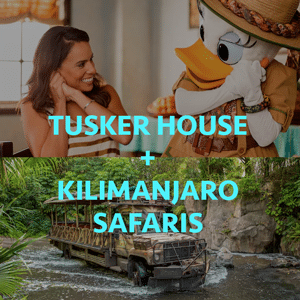 Tusker House is located in the Africa section close to Safaris. People finishing up early are usually able to head to Safaris before the park opens. Have you been able to do a Disney World breakfast with a ride? Or have you done something else that's not on the list? Please share in the comments. How do you get to the park if the buses don’t leave until 45 minutes before the park opens? What is the earliest possible reservation for Hollywood & Vine in Hollywood Studios? I have a 9:05 scheduled… but if earlier slots are sometimes available I will keep watching closely to bump it back earlier. We had a reservation for crt for 8.20, but were allowed in the park about ten to 8, and were seated at CRT at 8am. By the time we finished we headed straight for Peter Pan, and did that, and pirates of the Caribbean before 9am. This was back in July 2015, so not sure if it’s changed much now, but did all of Frontierland and Adventureland by 9.45 and it was a weekend! Hoping to do the same for our trip next year! 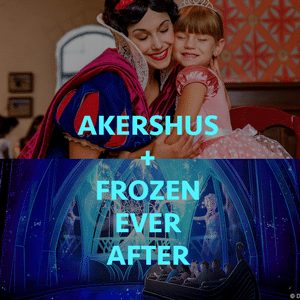 I made a 8.10am reservation for Akershus last summer, had a great breakfast, met all princesses, explained to server we wanted to be out pre-opening to get in line for Frozen Ever After. They were great, we were out by 10 to 9 and we were the third family in the queue (the others had done the same as us). We were done by 9.05am & when we got out the queue was 50 mins long already! Worked amazingly ? This is what I am hoping to do. How was the breakfast? We have a breakfast reservation at Be Our Guest at 8:50AM. The park opens at 9AM. Do you think we might be able to ride the seven dwarfs mine train before we go in to breakfast? No. The ride will not be running that early but the line will certainly be forming. If you have yet to go, in another blog post of WDW, they mentioned to treat a late reservation like an early one. Even if your reservation is at 8:50 AM, maybe they will take you earlier. So regardless, make sure you are inside for your reservation as if it were at 8:05 AM. It doesn’t hurt to try! Yes! We rode 7DMT 4x before the park opened! We just had to get off & go back thru FP entrance. Worked like a charm! Be Our Guest. 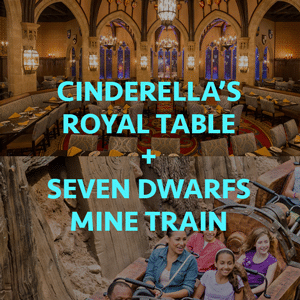 Snag a 8 ish reservation then you can get on Seven Dwarfs or get in line for any other Fantasy land ride. Peter Pan, Pooh, meet and greet etc. Any idea if this would work with an 8am Bippity Boppity reservation? Yes, we had a boutique reservation and got to hop on Peter Pan before our Royal Table Reservation. On my last trip we did an 8:10 BOG and an 8:15 BOG another day. The first day we rode 7DMT then got in line for Peter Pan as the park was opening (by the time we were done with Peter Pan the park had only been open for 5 minutes and we had gone on two rides that usually have long wait times). The second day we did 7DMT twice before the park opened. We were celebrating my college graduation on the trip and I had a Mickey ears graduation cap and a celebration button so both days I got to ride in the very first row of 7DMT. The pre-park opening breakfast worked perfectly for my group and I plan on doing it again on my next trip! We just got back from a trip in September. We had an 8:00am at BOG. After breakfast we walked over to the area near 7Dwarfs, there was a cast member and a line forming. About 10- 15 minutes before park opening they led us to the fast pass lane. We rode it 3 times in a row before the line formed when the park opened. It was awesome! Does anyone have any tips for getting an early reservation at CRT? I called the very first day at 6 AM CST, but was only able to get 10:20. Online opens an hour prior to the phone lines, so use the online option and also try for later in your stay as people can book 180+10 if you’re onsite. I made an 8:45 am reservation at BOG originally so we could get in early/see the castle without a ton of people (I understand rope drop has changed though). I have a back up BOG reservation at 10:20 am. We do want to see the opening show at the castle and my kiddos have no interest in the mine train… am I better off keeping the 8:45 am reservation and showing up early to eat/take pics and still get to the opening show, or should I drop it and keep the 10:20 am?? unfortunately they moved the rope drop beyond Main Street and everyone is shoved up by the Castle. If you are interested in seeing the show I would keep your 10:20 Show up by at lease 8:30 watch the show then maybe try to get some picture after the main rush is over??? 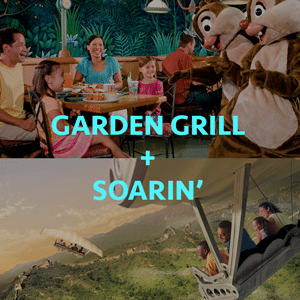 We did Garden Grill and Soarin, we could have probably even gotten on Soarin twice if my son had liked it better. We also did Hollywood and Vine and BOG because my husband isn’t a crowd person so we were able to enjoy the mornings in the park before they got too crowded. About how long were you at BBB? I’m trying to decide between doing an 8am BBB or 8am breakfast. Done BOG/7DMT twice. Once w/ 8:10 Dessie, they still let us in early even with EMH and we rode first with no one else in train then went to BOG. Love taking pix down Main Street with few people in background, too. Were you staying on disney property? Has anyone had success with an early morning reservation at the Tusker House and then riding one of the Pandora rides? Wondering the same! We leave in a month and have reservations for Tusker House 8am. Is it worth keeping our reservation in hopes to get on Flight of Passage or will it hurt us? Everything I read says they let you in at 8 without reservation!! I didn’t fast pass it because we have a child under height restriction and fast passed Navi River Journey instead. Ahhhh my husband and older children are freaking out. I’m in the same boat, Lesley… hoping for some advice. We schedule an 8:10 Tusker House, not realized that Animal Kingdom has extra magic hours that day. Eek. But thankfully we are trying to ride Navi River, and I’m wondering if we should try to get in the park at 7:45, ride it, then go to breakfast. It’s a risk. I hate to lose Tusker House reservations. BUT we have a 3 year old, and I really don’t care to wait in a 90 min line with him. We just did this. 8:15 reservation at TH on 4/29, finished at 8:45am. Made it to Pandora at 8:50ish, with an advertised 90 minute wait. It actually was about 40. The only clue for us, was that no one was standing in queue outside, so we decided to give it a shot. We were finished and at Navi River by 9:45. We ate at BOG and then went straight to Princess Fairytale Hall. Met all four princesses right st park opening. We chose this over 7DMT because we had a Fast Pass for that, but not to meet the princesses.